It is an understatement to say that it has been a challenge to manage one’s business in the lumber and building industry in 2018. A record climb in lumber prices in the first half of the year was followed by a two month plummet that left us all exasperated. Couple that with chronic labor shortages in nearly all trades as well as escalating material costs in most other scopes of work, and the environment surrounding construction projects just feels edgy. For an industry notorious for their savvy at bobbing and weaving with any punches the market throws our way, fatigue isn’t something we are accustomed to. Yet, here we are, left trying to navigate profitably through the second half of the year. We have plenty of booked business in hand, but uncertainty surrounds nearly every move. The first five months of 2018 saw a historic bull market for lumber products. From January 1st to June 1st, Contract Lumber’s Commodity Lumber Price Index (CLPI) gained $155.16, or 40.49%. Gaining weeks outpaced losing weeks during that timeframe 18 – 4, with that four week downturn sandwiched between two 9-week runs of over 20% each. The June 1st CLPI reading was the highest ever recorded, registering $538.38. In fact, it blew through the previous high of $477.80 set in 2005. Random Length’s framing lumber composite also set a record, surpassing the previous high set back in 1993. The surge was relentless, with pricing for all products in all species escalating. Buyers were scrambling for coverage and mills pushed order files out well beyond their comfort zone. Producers were firmly in control of the market and emotions were running high on the receiving end. The abrupt correction happened much faster than the drawn out 22-week run-up. Over the next ten weeks, Contract Lumber’s CLPI lost 23% of its previous gains, with seven of those weeks registering double-digit losses. The slide reminded me of the precipitous decline after a long and healthy expansion back in 2013, when the CLPI dropped 33% in a 13-week free-fall, from $464 down to $310. The intensity and quickness of the correction was not necessarily a surprise to those in the lumber business. The market has a history of such acute reactions following severe climbs. It’s typically a sign that something other than true supply-demand dynamics may have been at play and the market elevated more than it ever should have. In the 2018 bull market, it was a combination of supply-side constraints and disruptions that pushed order files out weeks,—even months in some cases. But more on that later. When the order files did dry up, and discounting started, buyers scampered to the sidelines, sales slowed to a crawl, and prices started falling. Mills were still producing around the clock and quick-ship material was available again. But producers were finding little success in searching for trading levels. Buyers, many still receiving late shipping railcars purchased months prior, were able to forgo participating in the market on the way down, save for filling the most immediate holes in their inventory. Most knew that their inventory positions were going to be on the wrong side of the market anyway, so they wanted to catch the bottom as best they could. The bottom, at least for now, hit two weeks ago when prices firmed, then advanced, putting an end to the skid. Buyers stepped-in for volume purchases not wanting to miss an opportunity to secure fall inventory at what appeared to be a considerable value compared to pricing three months ago. The slide was over. Of course, when commodity markets deviate wildly like this, people complain—especially when it comes to lumber. They point fingers, they speculate, they accuse. It is can be hard to separate fact from fiction when there are so many emotions involved. These passions can even sow seeds of discord between entities that are entirely dependent on each other, like builders (consumers of wood) and lumber producers (sellers of wood). In a recent National Post interview, NAHB CEO Jerry Howard, made claims of profiteering by domestic lumber producers in the market run-up earlier this year comparing them to oil cartels back in the 1970’s. Obviously, U.S. lumber producers quickly called foul, but the damage was done – leadership of the largest building organization in the country, pointing a finger at American lumber producers, essentially saying they colluded to manipulate the lumber trading landscape and were responsible for skyrocketing lumber prices. For my part, I think the lumber commodity landscape is too big and too complex to think that there could be plotted manipulation that would border on profiteering. Did U.S. producers stand to benefit from Canadian lumber tariffs? Absolutely. But that was the whole idea of executing a trade tariff. Were mills pushing prices higher on their products? Undoubtedly – that’s what free supply/demand markets do! It’s fair play to make it while you can. When two people want the same board the highest bidder gets the board. And when nobody wants your board? You are begging for a bid…any bid. That’s how a free market structure is supposed to work. Of course there is always gamesmanship and posturing in the mix—that’s a given. But profiteering? If you mean are they trying to maximize profits, well then, I suppose they are. But to suggest that lumber producers got together and conspired to drive this lumber market to record heights by manipulating production, colluding with their competitors to push stud or OSB prices higher every week – I just don’t buy it! And until you produce substantial evidence that corroborates your accusations, I think it is reckless and counterproductive to throw out a claim that drives a wedge between the very relationships that you rely on for your success. Understand that I am not in favor of lumber tariffs. I believe they are unfair, unwarranted, and are essentially a tax on the American consumer. Maybe I would feel different if somewhere in the last 30 years the U.S. Commerce department would have won one of their countervailing and anti-dumping duty battle in the international courts, but they never have. And now that the current administration is trying to do away with the dispute-resolution process that has repeatedly ruled against them, they probably won’t have to. The U.S. construction market needs Canadian lumber. On average, one-third of our wood comes from Canada every year. It seems to me that if we treat both sides as the trade partners we are, we could come up with a negotiated softwood lumber trade agreement that could be fair and beneficial for both sides. It does not appear that the current administration has any real intention of doing that. Instead, we are left with a 20+% tariff on Canadian lumber, extremely volatile lumber markets, and frustration on both sides of the dispute. So, if it was just profit-taking and not profiteering, just what did happen to push this market to historic levels in the first five months of the year? As per usual, it is seldom just one thing that drives a complex commodity market. Tariffs, levied back in 2017, certainly had an impact on lumber prices carrying over to the new year. We entered the year 17% above where we started 2017. But the market had actually been gaining strength for the last two years, starting in late 2015 when lumber bottomed out at $246 (CLPI). While there were adjustments along the way, gaining weeks outpaced declining weeks by 56%. The CLPI average was 24% higher in 2017 than it was in ’16. And this year, the CLPI average to date is up another 19% over last year. So the market has been gaining steam for a while. Last year’s journey is well documented: increasing housing demand, followed by tariffs, followed by a hurricane, shadowed by historic flooding, followed by another hurricane, and capped-off with horrific forest fires. In a nutshell – a calamity-strewn year (some natural, some not-so-much) that produced volatility in the lumber market like we hadn’t seen in a decade. It was painful, but in the meantime everyone was busy. The hope was that 2018 would calm down and offer a more traditional lumber market cycle. Well, obviously that did not happen. Lumber took off on its historic track straight out the gate and whipped the entire market into a frenzy. Lumber prices spiked the aforementioned 40%, a whopping 93% since hitting this decade’s bottom just two-and-a-half years earlier. The demand for housing so far in 2018 has been steady, albeit not remarkable by historic housing recovery standards. In May, U.S. housing starts reached their highest level in 11 years, to a SAAR of 1.350 units. Since that time, starts have fallen back, but are still running 6.2% higher than the same period last year. The multi-family segment has outperformed analyst expectations in the first half of the year, posting a 10% growth in multi-family starts over last year. Supply-side foibles though, seemed to be more of a catalyst to the spike in lumber prices than the strength of demand. And then back to those lumber tariffs. One consequence of the duties on Canadian lumber was that producers north of the border were looking for alternative trading partners. Lumber imports from Canada in the first half of 2018 slipped 6% on the heels of a 17% decline last year. U.S. lumber production was up just 2.8% while U.S. exports were up 14.7%, also limiting supplies available for American consumers. There was an uptick of 53% in overseas imports but that volume woefully missed replacing the lost Canadian stock. The bottom line: there was less lumber available on the market in the first half of the year. With supplies faltering and solid demand, lumber prices pushed higher. The real supply-side story so far this year had nothing to do with lumber producers north or south of the border. Transportation disruptions magnified the problems generated by a tight supply balance. Both rail traffic and over-the-road trucking combined to wreak havoc on the lumber market. Late shipments, sometimes months behind schedule from the railroad, crippled just-in-time inventory management and forced buyers back out into the market to cover holes or beef-up supply that they had already secured. It was a nightmare for the entire lumber distribution system as mills actually had to shut down or slow production because they had exhausted their room to store material while waiting on rail cars. When the situation did improve and these railcars starting hitting, distribution absorbed an abundance of wood. That buildup of inventory is what enabled buyers to stay off the market when it did crack, which forced a more intense slide in June and July. Trucking offered its own brand of frustration. The implementation of Electronic Logging Devices to replace paper logs slowed over-the-road productivity. At the same time, chronic driver and equipment shortages were creating a significant imbalance in capacity. Rates for both transportation modes posted healthy rate increases throughout the year, some as high as 28%. 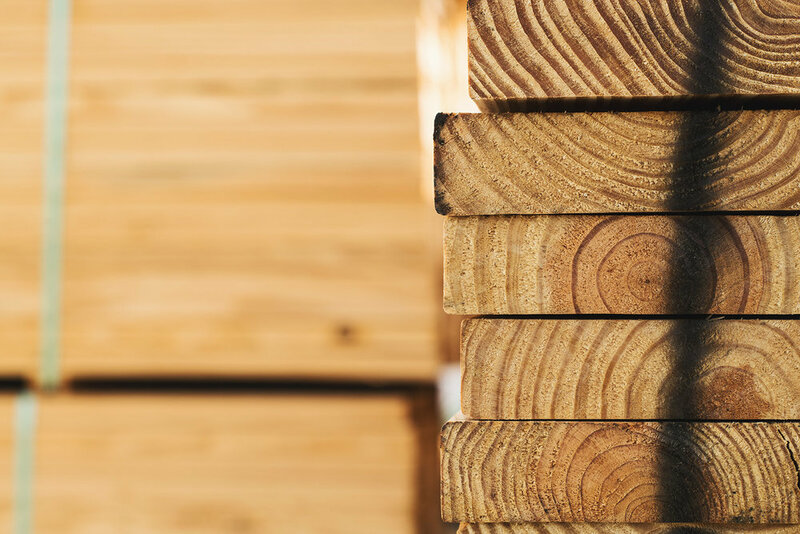 The movement of lumber products will continue to pose challenges for industry going forward. Aside from the transportation challenges, there are several distinct concerns that offer resistance as we plod forward in the housing recovery. Rising costs for builders and the void in available trade labor rank toward the top of most everyone’s dance card. The resulting growing housing affordability concerns are having a strong impact on builder’s ability to construct homes at competitive price points—particularly for newcomers entering the housing market. Housing affordability reached a 10-year low in the second quarter. Just 57.1% of all homes sold from April through June were affordable to families earning the U.S. median income of $71,900 – down from 61.6% in the first quarter. Rising home prices and interest rate creep were primarily to blame. Other components hampering affordability are exorbitant regulatory costs (said to be $85K for a new home and even more for a multi-family unit) and the high price and limited availability of developed lots to build on. I would be remiss if I did not mention other trade tariff fears that the current administration either has implemented, or is threatening to enact, aside from the Canadian lumber duty. There are many other building materials that are, or will be, subject to increased tariffs should these trade wars continue. 2018 has already been the most volatile year on record for lumber prices with 16 double-digit weekly moves so far this year. The landscape shows no signs of changing, so expect to experience more instability in the lumber market moving forward. Mills, faced with a lack of available labor, are struggling to increase lumber production. Log availability and their exceedingly high cost are also hampering producers. While we have not seen the catastrophic natural calamities so far this year that we experienced in 2017 (knock on wood), fire and hurricane season is just now starting. That said, fire threats in western Canada and the northern U.S. may have been partially responsible for halting the recent skid in lumber prices. Let’s end with the good news. Consumer demand for housing remains strong due to a growing economy and job market and favorable demographics. Income growth is expanding (although slower than most economic analysts feel it should be), and the number of new household formations is trending higher. The home ownership rate jumped to a four-year high in the first half of the year (according to a report by the U.S. Census Department). Another positive sign in that report was that the biggest jump in homeownership rate was among those under 35 years old. Worries about the younger generations missing out on the wealth-building opportunities inherent in homeownership may be quelling. Also, current homeowners have restored most, if not all of the equity in their homes. This bodes well for the move-up market. The reality is that the nation is still facing a shortage in both single-family and multifamily housing. Although, not without its challenges, this unmet demand is likely to spur growth in both construction sectors for the next couple years.